Today I'm taking part in the blog tour to celebrate the release of The Bunker Diary by Kevin Brooks. I will be posting my full review later today but it is one of the most unusual books I've ever read and one that I found it really difficult to put down. 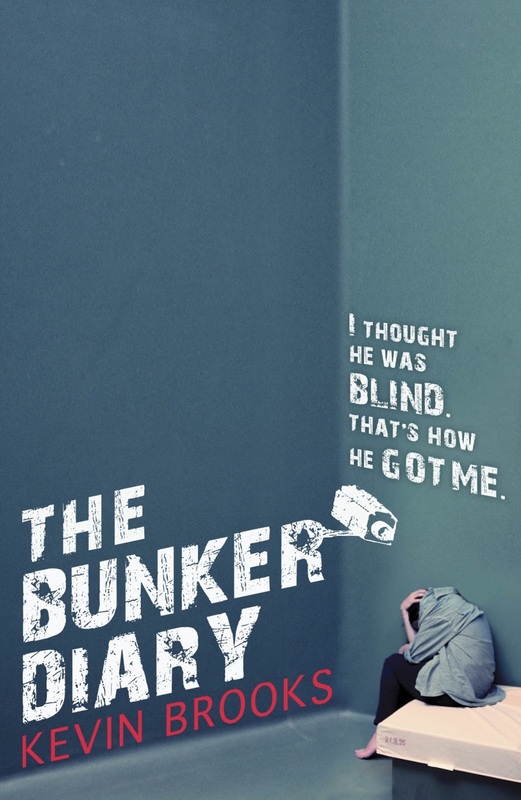 Room meets Lord of the Flies, The Bunker Diary is award-winning, young adult writer Kevin Brooks's pulse-pounding exploration of what happens when your worst nightmare comes true - and how will you survive? This is what I know. I’m in a low-ceilinged rectangular building made entirely of whitewashed concrete. It’s about twelve metres wide and eighteen metres long. A corridor runs down the middle of the building, with a smaller corridor leading off to a lift shaft just over halfway down. There are six little rooms along the main corridor, three on either side. They’re all the same size, three metres by five, and each one is furnished with an iron-framed bed, a hard-backed chair, and a bedside cabinet. 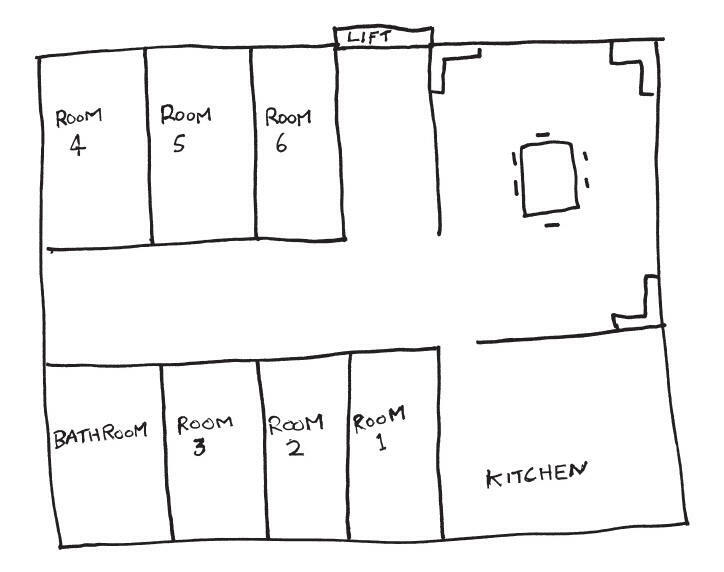 There’s a bathroom at one end of the corridor and a kitchen at the other. Opposite the kitchen, in the middle of an open area, there’s a rectangular wooden table with six wooden chairs. In each corner of the open area there’s an L-shaped bench settee. In the bathroom there’s a steel bath, a steel sink, and a lavatory. No mirrors, no cupboards, no accessories. 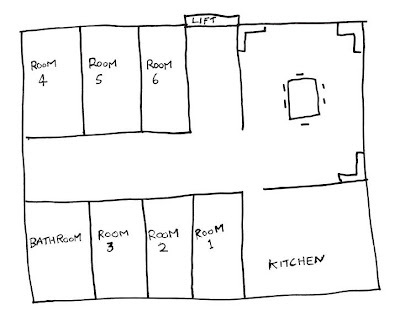 The kitchen contains a sink, a table, some chairs, an electric cooker, a small fridge, and a wall-mounted cupboard. In the cupboard there’s a plastic washing-up bowl, six plastic dinner plates, six plastic glasses, six plastic mugs, six sets of plastic cutlery. It feels underground in here. The air is heavy, concrete, damp. It’s not damp, it just feels damp. And it smells like a place that’s old, but new. Like it’s been here a long time but never been used. There are no light switches anywhere. There’s a clock on the corridor wall. The lights come on at eight o’clock in the morning, and they go off again at midnight. There’s a low humming sound deep within the walls. I thought he was blind. That’s how he got me. I still can’t believe I fell for it. I keep playing it over in my mind, hoping I’ll do something different, but it always turns out the same. It was early Sunday morning when it happened. Yesterday morning. I wasn’t doing anything in particular, just hanging around the concourse at Liverpool Street station, trying to keep warm, looking out for Saturday night leftovers. I had my hands in my pockets, my guitar on my back, my eyes to the ground. Sunday morning is a good time for finding things. People get drunk on Saturday night. They rush to get the last train home. They drop stuff. Cash, cards, hats, gloves, cigarettes. The cleaners get most of the good stuff, but sometimes they miss things. I found a fake Rolex once. Got a tenner for it. So it’s always worth looking. But all I’d found that morning was a broken umbrella and a half-empty packet of Marlboro. I threw the umbrella away but kept the cigarettes. I don’t smoke, but cigarettes are always worth keeping. So there I was, just hanging around, minding my own business, when a couple of platform staff came out of a side door and started walking towards me. One of them was a regular, a young black guy called Buddy who’s usually OK, but I didn’t know the other one. And I didn’t like the look of him. He was a big guy in a peaked cap and steel-tipped shoes, and he looked like trouble. He probably wasn’t, and they probably wouldn’t have bothered me anyway, but it’s always best to play safe, so I put my head down, pulled up my hood, and moved off towards the taxi rank. And that’s when I saw him. The blind man. Raincoat, hat, dark glasses, white stick. He was standing at the back of a dark-coloured van. A Transit, I think. The back doors were open and there was a heavy-looking suitcase on the ground. The blind man was struggling to get the case in the back of the van. He wasn’t having much luck. There was something wrong with his arm. It was in a sling. It was still pretty early and the station was deserted. I could hear the two platform men jangling their keys and laughing about something, and from the sound of the big guy’s clackety-clack footsteps I could tell they were moving away from me, heading off towards the escalator that leads up to McDonald’s. I waited a little while just to make sure they weren’t coming back, then I turned my attention to the blind man. Apart from the Transit van, the taxi rank was empty. No black cabs, no one waiting. There was just me and this blind man. A blind man with his arm in a sling. You could walk away if you wanted to, I told myself. You don’t have to help him. You could just walk away, nice and quiet. He’s blind, he’ll never know, will he? But I didn’t walk away. I coughed to let him know I was there, then I walked up and asked him if he needed any help. He didn’t look at me. He kept his head down. And I thought that was a bit odd. But then I thought, maybe that’s what blind people do? I mean, what’s the point of looking at someone if you can’t actually see them? I bent down and picked it up. It wasn’t as heavy as it looked. ‘Where do you want it?’ I asked. There was no one else in the van, no one in the driving seat. Which was kind of surprising. The back of the van was pretty empty too, just a few bits of rope, some carrier bags, a dusty old blanket. I was beginning to feel a bit uneasy now. Something didn’t feel right. What was this guy doing here? Where was he going? Where had he been? Why was he all alone? How the hell could he drive? I mean, a blind man with a broken arm? ‘If you wouldn’t mind?’ he said. Maybe he isn’t completely blind? I thought. Maybe he can see enough to drive? Or maybe he’s one of those people who pretend they’re disabled so they can get a special parking badge? I shrugged off my doubts and stepped up into the van. What did I care if he was blind or not? Just get his suitcase into the van and leave him to it. Go and find somewhere warm. Wait for the day to get going. See who’s around – Lugless, Pretty Bob, Windsor Jack. See what’s happening. I was moving towards the front seats when I felt the van lurch on its springs, and I knew the blind man had climbed up behind me. ‘I’ll show you where to put it,’ he said. I knew I’d been had then but it was already too late, and as I turned to face him he grabbed my head and clamped a damp cloth over my face. I started to choke. I was breathing in chemicals – chloroform, ether, whatever it was. I couldn’t breathe. There was no air. My lungs were on fire. I thought I was dying. I struggled, lashing out with my elbows and legs, kicking, stamping, jerking my head like a madman, but it was no good. He was strong, a lot stronger than he looked. His hands gripped my skull like a couple of vices. After a few seconds I started to feel dizzy, and then . . . So what do you think of the extract? Are you hooked yet? I'm afraid that if you want to know more you're going to have to buy the book! Don't forget to check out the rest of the stops on the blog tour for more information about The Bunker Diaries.